Intensive preparation for Oral examinations by teachers who are experienced examiners for these examinations. The Oral Irish exam now accounts for 40% of all marks of the Leaving Cert Gaeilge exam. We have a three week course on Cúrsa B (27/06/18 - 18/07/18) and a two week course on Cúrsa C (22/07/18 - 05/08/18) that cater for those in preparation for the Oral Irish exam. The Junior Certificate course requires the student to have a good knowledge of spoken Irish. Our courses at Coláiste Chonnacht are prepared by teachers with the exam format in mind. We will place special emphasis on topics linked to the students own life and surroundings. We provide a special course for primary school students paying particular emphasis on students going into second level during the coming school year. Interviews are necessary for all first time applicants. The purpose of the interviews is not only to determine the level of competency in Irish of the applicants but also to explain the regulations regarding the speaking of Irish during the course. Interviews will be held at convenient locations to parents/students and at least one parent/guardian is expected to attend with each applicant. Cúrsa A and B - full fee is €950. Cúrsa C - full fee is €650. This covers full accommodation, tuition fees and local transport where and when necessary. The Deposit / Éarlais on each of Cúrsa A, B and C is €200. The balance is to be forwarded on receipt of notice from the Coláiste prior to commencement of course. * All cheques or postal orders should be made payable to Coláiste Chonnacht. * Refunds: All applications for refund must be accompanied by a medical certificate. At least four weeks notice in writing of cancellation must be given before any refund will be made. A registration and administration fee is non-refundable in all cases. No refund can be made in the case of non-completion of course or in cases of dismissal. * Optional extras: Tour to Aran Islands and watersport activities. 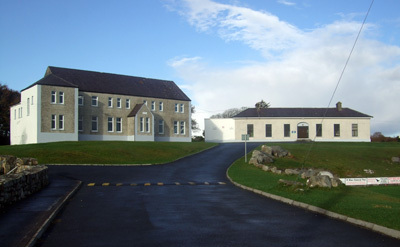 The College is staffed by a Principal, Teachers and Ardchinnirí (senior student assistants). The ratio of staff to students on average is 1:12. The Department of Education determine the qualifications and sanctions the appointment of all staff. The courses are inspected regularly by the Department of Education inspectors. The majority of staff are native Irish speakers and all staff are required to have suitable experience in teaching Irish to students of varying levels of competency. All particulars regarding travel enable you to purchase tickets at special rates will be forwarded 14 days in advance of travel. The primary aim of our courses is to enable the students to achieve real progress in Irish in an atmosphere of relaxation and enjoyment. However, there are a few rules which have to be strictly, though fairly, enforced and we wish these to be brought to the students and parents attention before coming to the College since contravention of any of these will result in expulsion from the course and forfeiture of fees. Entry into licensed premises of the consumption of possession of alcoholic drink or drugs at anytime during the course is strictly forbidden. Students may not be absent from guesthouse after 10pm without special permission. Serious company-keeping is not allowed and it is left to the discretion of the Principal to deal with sensibly and in the best interests of students, parents and the college. Misbehaviour, verbal or physical intimidation, whether intentional or otherwise will not be tolerated. Students who cause serious disruption or who refuse to accept normal discipline will be expelled from the course. All accommodation arrangements are made by our office staff. The students stay in houses which have to be approved by the Department of the Gaeltacht before being accepted by the college. The amount of space to be allocated to each student is determined by the Department's Inspector. Each student has a single bed. At least four weeks notice in writing of cancellation must be given before refund will be made. A medical certificate must be furnished with any application for refund. A registration and administration fee is non-refundable in all cases. No refund can be made in case of non-completion of any course in cases of student dismissal.